On the one hand it was gradual, like the appearance of grey in my beard. On the other, it was quite sudden. Not too long ago, I wouldn't have even known where to find sports talk on my car radio, but these days I listen to little else. A lifetime of passionate indifference to sports has been supplanted by such zeal that I no longer recognize myself. To be clear, I've always been aware of sports. Growing up, you can't really avoid them. Much as you may desperately want to. On a personal level, I didn't really get much out of my librarian/coach's incessant "HOOF THE BALL!" as we careened around our elementary school's pockmarked soccer field. And despite my deep Canadian roots, I didn't enjoy the unparalleled agony my arches threw at me whenever I donned skates. I certainly didn't appreciate getting placed in beginners' tennis three years in a row, getting picked near last for every team, scoring nothing more than a participation pin in that sadistic 1970s annual gym-class ritual known as the Canada Fitness Awards (Standing long jump? Really?! No, I couldn't just swing my arms and leap more than a foot or two … and when would that be useful?). Over time, a mere aversion to athletics ripened into a full-fledged phobia. As for fandom, I dabbled. Took in some Blue Jays games with the family, well before those World Series wins. Went to a few Leafs games back in the days of Sittler and Salming. For a time I even knew all the players. Sure, I've gotten sucked into the Olympics (especially when Canada hosted, and when it used to be just a twice-every-four-years kind of commitment). But really, aside from my backside on those metal benches in Toronto's old Exhibition Stadium, nothing stuck. 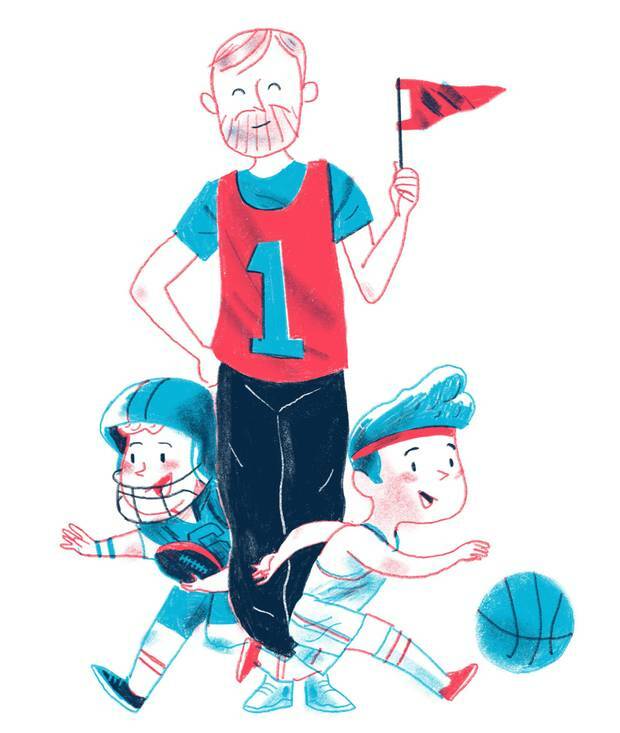 For me, football was just something that rendered Dad unavailable for other stuff. Hockey pillaged far too many Saturday nights. Baseball was interesting enough when the Jays were doing well, but deadly when they weren't. And basketball? Back and forth a few dozen times for 48 mesmerizing minutes. For most of my adult life, I've had nothing to contribute to any sports conversation beyond a thoughtful, "Well you know, it could go either way." I've marvelled at those who knowledgeably debate stats and prospects, who pick apart a game as easily as I pick apart a sandwich. Heck, I always thought, I can barely keep track of my favourite TV shows. How do these guys mystically know when all the games are even on? And then I had kids. Two sons, two and a half years apart, who would likely expect things of me. I certainly would have if I were them (my own dad had his bad knees to fall back on; short of inventing something, I had no such impairment). I knew I could cover some basics – I could play catch with a baseball pretty well, as my dad sometimes did with my brother and me, and whether or not it counts, I'm not awful with a Frisbee – and my wife was pretty sporty in her own right. But I could only feign sports skills and enthusiasm until the boys were only a few years out of diapers. Fortunately, of course, the proverbial village swooped in at just the right time. There were programs. There were friends. There was gym class. The craters in what I perceived to be my paternal credentials would be duly filled by others in our sons' growing sphere. A couple of years ago – the boys now into their teens – a couple of other things happened. First, the Jays made that spectacular run of 2015. We all got into it together, sat in the front row of the bandwagon. And second, as a special treat, I took our oldest to a Toronto Raptors game against defending champs Golden State. He pointed out some plays to me, taught me what to look for. Helped give it life, and meaning. I found myself tuning in to future games from the couch. Having already seen the players in person, it felt like I already knew them and their personalities, their strengths and weaknesses, their good habits and bad. I soon hungered for analysis, gobbling up postgame wrap-ups and next-day call-in shows. I put a tentative toe into water-cooler discussions, then waded in waist deep. My vocabulary evolved, too: the "cleanup" guy had nothing to do with the grounds crew; "pick and roll" wasn't just a habit you longed for young boys to grow out of. It's still fairly new, but now – at 50 – I think I get it. I've joined the club in the top of the sixth. This aging dog has learned some new tricks, thanks in large part to his own pups. Of course the seasons are still marked by traditional holidays, the rhythm of the school year, the weather. But March is also spring training, a time of promise and renewal; July is a hot lingering sun smiling down into an open-domed stadium; September is all long shadows, hand-wringing and high stakes. October is watching the new guys gel with the veterans on the hardwood; February is all-star weekend; April is sweating over another shot at LeBron. Where there's history and majesty to baseball, there's a brash electricity to the NBA. And I love it all. I watch whether my teams are dominating their divisions or floundering in the basement. I hope. I care. I yell, cringe, swear. Paul Ackerley lives in Toronto.